Located in the Comoros group of islands, between Madagascar and Mozambique, Mayotte is set apart by its decision in the 1970s to remain a French protectorate instead of becoming part of the independent Union of the Comoros. In 2011 the island officially became an Overseas Department of France. Although it is officially part of France, Mayotte has little in common with its parent country. French, the official language, is spoken by only about 35 percent of the population, with local dialects like Mahorian and Malagasy more common. The population is mostly Muslim, though with some interesting cultural beliefs and practices unique to the region. The standard of life is also not quite up to French standards, but the infrastructure is more than sufficient for travellers, who are mainly drawn to Mayotte for the scuba diving and hiking the undulating volcanic landscape. Mayotte is made up of two islands, Grande-Terre and Petite-Terre, with sparkling white sand beaches and excellent diving among the colourful coral reefs. Sea turtles lay eggs on the southern beaches, while lemurs make their home in the interior. The best views of the islands are to be had from the summit of Mount Choungui, a popular hiking spot. 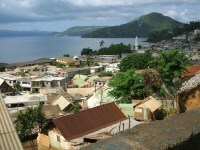 The islands have no large cities, however the biggest town, Mamoudzou on Grand-Terre, is a busy town with banks, restaurants, hotels, bars, and a bustling market. Mayotte is a stunning setting for a relaxing holiday on the Indian Ocean; however, it is considerably more expensive than other islands in the archipelago, with prices on a par with destinations in Europe.